Sunshine Leather Inc. is a retail and wholesale leather goods company located in Central Florida. We offer engravable leather goods such as: bracelets, necklaces, key chains, cell phone straps and much more. Our products are unique and great for existing business owners who are looking for new products. We also offer custom made displays and engraving machines to our customers. For any questions please feel free to contact us. In addition to Leather ID Bracelets, we have an extensive inventory of Leather Products that come in many different styles and colors. Our products are all proudly handcrafted in the in the USA by local artists. We are proud to offer the most beautiful line of leather jewelry available on the internet and elsewhere. 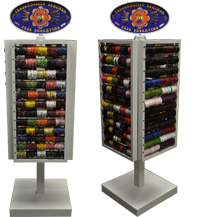 Sunshine Leather, Inc. is a well known company in the Leather Jewelry business with kiosks in malls throughout the United States including numerous malls in the Central Florida area. We also have a presence in theme parks such as Universal Studios and Six Flags.